What happens when you get the author of The Hitchhiker's Guide to the Galaxy and the creator of the Muppets in the same room? In the 1980s, Jim Henson met author Douglas Adams and together they tried to develop a television special starring the Muppets about the wonders of computers. 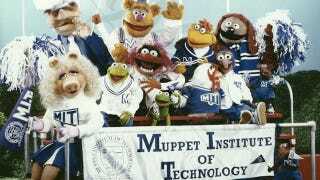 Adams had been working with the Henson team that year on the Muppet Institute of Technology project. Collaborating with Digital Productions (the computer animation people), Chris Cerf, Jon Stone, Joe Bailey, Mark Salzman and Douglas Adams, Jim's goal was to raise awareness about the potential for personal computer use and dispel fears about their complexity. In a one-hour television special, the familiar Muppets would (according to the pitch material), "spark the public's interest in computing," in an entertaining fashion, highlighting all sorts of hardware and software being used in special effects, digital animation, and robotics. Viewers would get a tour of the fictional institute – a series of computer-generated rooms manipulated by the dean, Dr. Bunsen Honeydew, and stumble on various characters taking advantage of computers' capabilities. Fozzie, for example, would be hard at work in the "Department of Artificial Stupidity," proving that computers are only as funny as the bears that program them. Hinting at what would come in The Jim Henson Hour, viewers, "…might even see Jim Henson himself using an input device called a ‘Waldo' to manipulate a digitally-controlled puppet." While Waldo certainly came to fruition, and Henson would teach children about the wonders of special effects and computer animation on The Jim Henson Hour, the Muppet Institute of Technology sits in the vault of brilliant ideas that simply never came to fruition. Jim Henson's Red Book, the site that uncovers the details of Henson's daily life, has a few concept art pieces from the show, as well as more details on Henson's relationship with Adams.